Chimpanzee "Ham". Image courtesy of NASA. 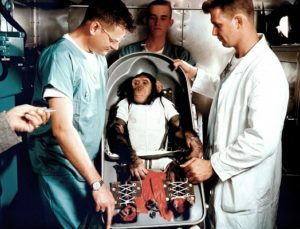 Today marks the 57th anniversary when Ham became the first chimpanzee in space. I want to take this opportunity to look back at the involvement of animals in the space industry. As early as 1948, animals were deployed on space flights before the space race between the US and the USSR (present-day Russia) started back in 1957. Both countries deployed animals to test the safety of space missions and to see if there is a possibility for humans to survive in space. These missions later helped pave the way for manned missions. Various kinds of animals were sent to space, including rabbits, dogs, monkeys and turtles, to name a few. Many perished along the way, but those that survived gave scientists hope that it was possible for humans to go to space ad come back alive. In the US, many of the space missions of the National Aeronautics and Space Administration (NASA) involved monkeys because it is believed that they hold more similarities to us than other animals. During the first space flights of 1948, monkeys were used in the experiments. Sadly, they did not survive the landing impact. However, not all hope was lost as following missions saw progress being made. Pictured left, Ham the chimp. On September 1951, Yorick was the first monkey to survive a space flight and was recovered safely. Later in 1959, Sam, a rhesus monkey, was used to test the launch escape system. He survived and landed safely in the Atlantic Ocean after being 82 kilometers above sea-level. 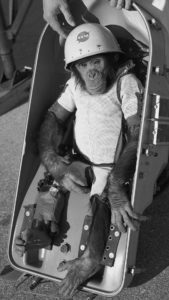 The most notable NASA animal space flight was in January 1961, when Ham, a male chimpanzee, was sent aboard the Mercury rocket on a sub-orbital flight. Not only did he experience weightlessness and was recovered safely, the success of his mission also paved way for Alan B. Shepard, Jr. later that same year. This coming 31 January will mark the date when Ham became the first chimpanzee in space. Laika, the space dog that has become the symbol of courage. While the US opted to send monkeys to space, the USSR decided to choose dogs instead. Female stray dogs were chosen for the experiment for their ability to control their waste and urine, and the perception that stray dogs are able to withstand colder temperatures than household pets. 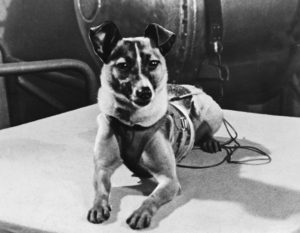 One of the most famous space dogs who went on a solo mission was Laika. She was picked up from the streets of Moscow, went through a hasty training and was sent on a one-way mission. She was the first animal to orbit Earth in 1957. Veterok (left) and Ugolyok (right), the two space dogs that hold the longest canine record in space. After its various missions deploying dogs, the USSR’s last canine mission was in 1966. Two dogs, Veterok and Ugolyok, were launched aboard the Kosmos 110 rocket to assess the prolonged effects of space radiation. The two dogs spent 21 days in orbit. After their safe landing, the two dogs held a world record of having spent the longest time in space, only to be broken years later in 1973 by astronauts aboard the Soyuz 11 mission. To this day, Veterok and Ugolyok still hold the record as being the canines who stayed the longest in space. The two dogs’ space mission marked the end of the long 16 years of Soviet space dogs’ era. Today animals are still being deployed in space missions, not so much as pioneers but rather as experimental subjects, notably to study the effects prolonged effect of microgravity and space radiation. Since the success of the Apollo 11 mission, animals are mainly sent up to space as “biological payloads”. Through the studies of Japanese rice fish (medaka) aboard the International Space Station (ISS), it has been found that the lack of gravity speeds up the production of osteoclast cells, causing bones to lose their density. Chimpanzee “Ham”. Image courtesy of NASA. As for another aquatic creature, the bobtail squids in their embryo stage were sent aboard the Endeavour space shuttle in 2011. Scientists wanted was to see how microgravity affects morphogenesis, the moment when an organism develops their shape. The squids were chosen because of a particular trait. They are able to produce bioluminescent light from a special organ, but only after taking in a particular bacteria, vibrio fischeri. Baby squids are born without this bacteria and when they take them into their body, the bacteria forces a change in their bodies that will make them more appropriate hosts. Scientists wanted to see if microgravity affects this transformation. The deployment of animals has been fundamental to space missions, a somewhat necessary evil. If it weren’t for the animals, we would not be able to have progressed this far. Their sacrifices have given us valuable data and ensured greater safety for future missions. It is undeniable that there is a looming question of ethics in regards to using animals in space experiments, but at least there are strict rules regarding the use of animals. According to Laura Lewis from NASA’s Amex Institutional Animal Care and Use Committee, animals chosen for space missions are humanely cared for with ethics in mind. “Animals can’t object, so people need to work on their behalf”. 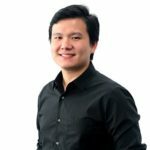 James Yenbamroong is CEO and founder of mu Space Corp. He is constantly searching for ways to use space technology to improve the lives of people.